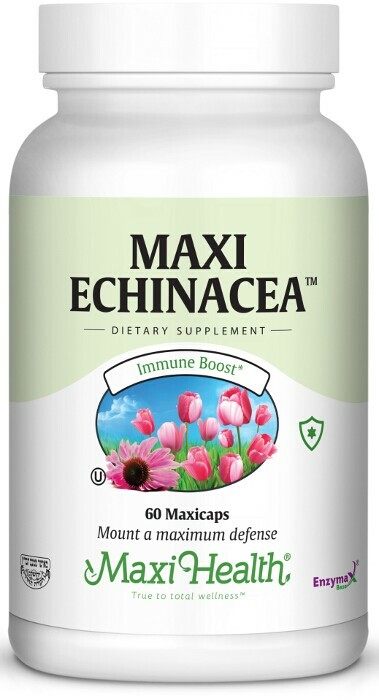 Maxi Echinacea™ is a 4% Echinacosides, standardized extract in each capsule. You’ll want to have it handy all year round. You and your family deserve the best; get it with Maxi Echinacea™. Take one (1) to three (3) Maxicaps ™ daily with meals, or as directed. Other Ingredients: Vegetable cellulose, microcrystalline cellulose, magnesium stearate, Enzymax® (calcium carbonate, bromelain, papain, lipase, amylase, protease, silica). This product contains no animal products, soy, wheat, yeast, salt, gluten, sugar, milk, artificial flavors, colorings or preservatives.